Zapier is a wonderful integration tool lets you connect 1000+ apps to automate many workflows between applications. This tutorial explains how to send Agenty data to Zapier. In short, our Zapier integration allows you to say "If X job completed in Agenty, then Y happens in another app"
With this integration, you can connect Agenty with 1000+ applications! Step 1 First, Go to Zapier website and signup or login your account. Then click on the Make a Zap! button. Step 2 Select Webhooks option. And you can also give it a name or Zapier will automatically name it like : "hook A", "hook B". Step 3 Select the 2nd option, called catch hook. The catch hook(or webhook) is like a data reciever and can read any data sent via a HTTP POST method in request body. Cick on the button Save + Continue. Step 4 Once you hit the save button, Zapier will create a custom webhook URL for your zap. Copy this URL to use in Agenty. Once you have the webhook URL, login to your Agenty account. 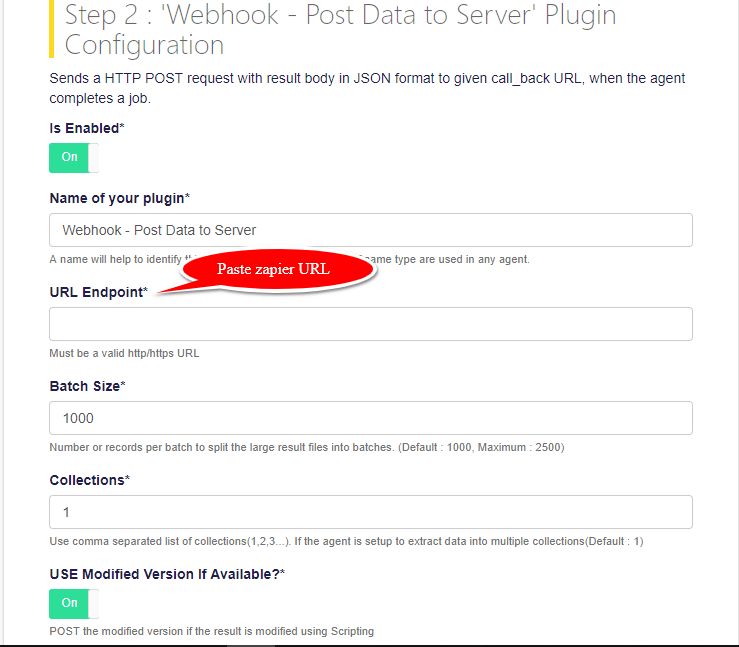 Step 1 Go to the agent page where you want to add the webhook > Click on the Plugin tab and then click on Add plugins button. Step 2 Now select the Webhook plugin as in screenshot below. Step 3 Paste the Zapier webhook URL in the URL Endpoint box. And than SAVE to attach this plugin to your selected agent. Agenty will trigger this plugin after a job has been completed for selected agent. So make sure you run your agent once to send the result to Zapier webhook for testing. Step 1 Return to your Zapier dashboard and click on the OK, I did this button. Step 2 Zapier will catch few records and show as in this screenshot. Step 4 Click on the Continue button, and you will see Zapier will read the objects array correctly in key-value format to fill up spreadsheet or anywhere else as per the action selected.